Conducting bicycle and pedestrian counts are necessary to help understand the region's complete transportation system. Data such as behavior, travel patterns and demands related to active transportation will not only inform policies and planning decisions but will also contribute to developing education, encouragement and enforcement programs. The Southern California Association of Governments (SCAG) and the Metropolitan Transportation Authority (Metro) have created Conducting Bicycle and Pedestrian Counts: A Manual for Jurisdictions in Los Angeles County and Beyond. The manual identifies two primary ways to generate bike/ped data; automated counts and manual counts. Automated Counts requires installing sensors on the street and sidewalk. Although very effective in counting people 24/7, the equipment also has it's limitations. Manual counts are great for determining gender, helmet use, travel direction, general age, and sidewalk riding. 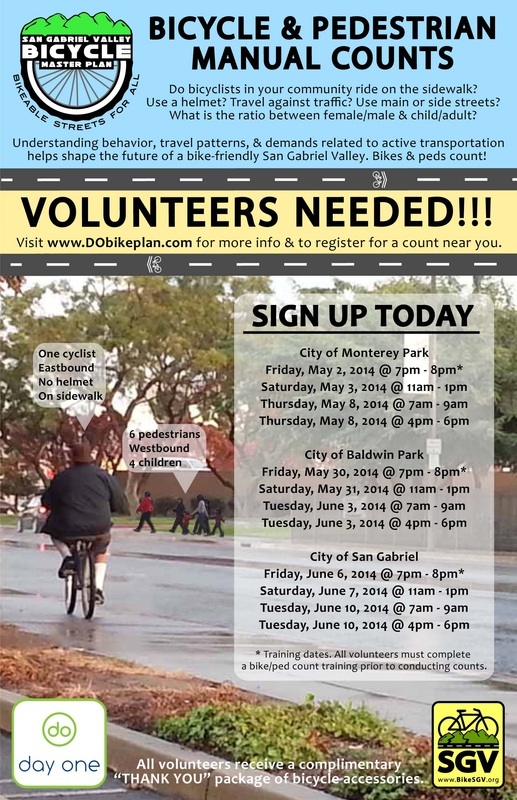 Volunteers are needed to conduct counts in Monterey Park, Baldwin Park and San Gabriel. Training and count dates are listed on the flyer (on the left).